How to Choose a Cord Blood Stem Cell Bank India? Cord blood stem cell storage has given a new dimension to the medical science. With this, stem cells now can be retrieved from the umbilical cord of a newborn and stored for years to come. It can be later used for the treatment of more than 70 potential diseases. 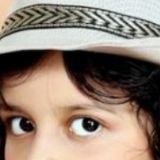 However, the cost of private cord blood stem cell bank in India is high, and the chances are lower than a family will use them. It becomes expensive because of the cost of processing cord blood and storing it in freezers for years. Studies have shown that stem cells, frozen longer than 15 years can be used. However, as cord blood cells have been used in transplants for only 20 years, it is not sure yet that how long it can be successfully stored. In any case, if you have a family history of certain diseases, like sickle cell anemia, leukemia; storing cord blood cells of your baby can benefit you in future. For this, you will have to choose a right cord blood bank. Here we tell you how to choose the right one. Cord blood banking options: Cord blood banking in India was a new concept till a few years ago, however, now it is rapidly becoming popular. There are two types of banking facilities: â&#x20AC;˘ Public Donor Banks â&#x20AC;˘ Private Banks Public Donor Banks Public donor banks allow parents to donate the cord blood of their newborn free of charge. They have a central facility through which anybody can use this blood which needs it. The stem cells are not stored specifically for a particular family or person. Once the cord blood is donated to a public bank, it is not owned by a person. If in future, any family member will need it, the registries will be searched for a match. It could be the one the family has already donated if it hasnâ&#x20AC;&#x2122;t been used by another patient. Private Donor Banks The private cord banks store the cord blood exclusively for specific family or person. It is why the expense of collecting and storing cord blood stem cells at private banks is higher. However, it guarantees to provide a donor perfectly matched stem cells for future use. If you have a family history of certain diseases which can be further treated with stem cells, them private donor banks are the best option. 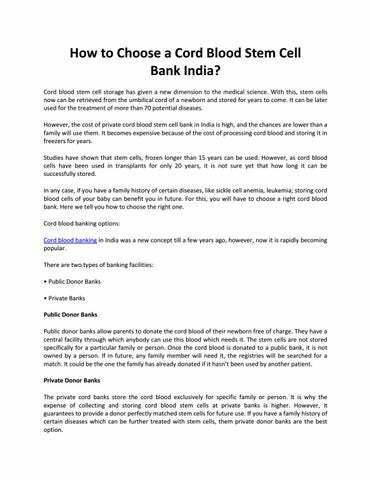 How to Choose a Cord Blood Stem Cell Bank India?